BlogHome » BLOG » To Reface or To Refinish Your Kitchen, That is the Question. The difference between refinishing and refacing a kitchen is a topic I discuss with potential clients on a regular basis. Many of the clients I eventually work with are people who initially set out to refinish their kitchens and end up refacing them instead. Once you know the differences, you will understand why. When refacing a kitchen, brand new kitchen cabinet drawer faces and doors are used to replace the existing ones, and quarter-inch wood is applied over the top of the cabinet boxes. This allows for a brand new look for your kitchen at a fraction of the cost. The refacing process gives the customer endless possibilities for choosing wood types, colors, and drawer & door profiles. To put it simply, refacing keeps the skeleton of the old kitchen and covers it with brand new skin. The process for refinishing a kitchen is different; a topical stain or varnish is applied over the existing boxes, drawer faces and doors. Nothing is new, but rather recolored. This process limits the possibilities for color outcome, and there is no change in wood type or drawer & door profiles. So keeping with the same analogy as above, refinishing keeps the same skeleton and skin of the old kitchen and just adds a new layer of “makeup” on top. Also, keep in mind that refinishing a kitchen is not the same process as refinishing furniture. Unlike refinishing furniture, refinishing kitchens does not include stripping the wood of the existing finish. When refinishing kitchens, the new finish is applied or etched onto what is already there (no stripping involved). This is considered a mechanical bond and is not as strong as the chemical bond you get with conversion varnish used in refacing. 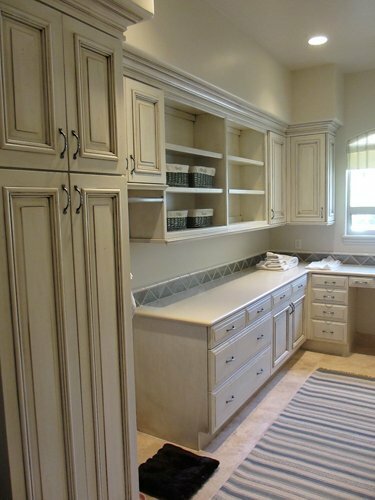 The end result and quality of the refinish is directly related to the quality of the existing cabinets and finish. Another difference between refacing and refinishing is the installation process and interruption to the home. When refinishing a kitchen, it must be tented off due to the indoor spraying and painting of smelly toxic chemical stains. Typically the kitchen will be out of commission for approximately 1 week which allows for 3 – 4 days of labor and a few days in between for drying / curing times. To contrast this with refacing a kitchen, since the new doors, drawer faces and quarter-inch topical wood is stained offsite, there are no toxic smells and the kitchen may still be accessed and used during the 3 – 5 day installation period. Although refacing is more expensive than refinishing a kitchen, it is the more economical long term higher quality solution. This is because of material used to stain the wood – conversion varnish. Conversion varnish is heat cured, or baked onto the wood, making it 2.5 times stronger than the refinishing materials used at the house. Conversion varnish gives the refacing products longevity and durability that refinishing a kitchen won’t. So now that you know the differences I’m sure you can understand why many of my clients choose to reface instead of refinish. It may be more expensive, but the product options, quality, durability and longevity are superior. Plus there is less of an interruption to the home during installation. Better Than New Kitchens is now booking for the Spring & Summer of 2016! To discuss your kitchen, contact Dan at the office (480) 429-7615, on his cell (602) 882-7415, or fill out the form on the Contact Us page.